Today at ShopTalk, Daniel Alegre, Google's President of Retail & Shopping, made a major announcement about the company's plans for the Shopping Actions program, which provides customers with an easy way to shop for products on the Google Assistant and Search, as well as on Google Express, with a universal cart. This unified and personalized end to end experience along the entire shopping journey, makes it simpler for users to purchase products. Google Express is an online shopping mall that features leading retailers including Costco, Target, Walmart and The Home Depot. 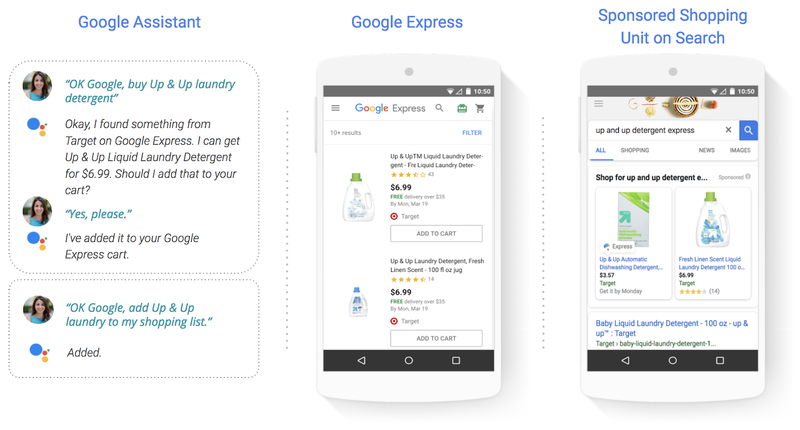 Instead of charging on a pay-per-click basis, Google will monetize Google Express by charging participating retailers a category-specific commission at the time of purchase. What we like about Google Express is the focus on the retailer. Retailer logos are prominently displayed, not hidden, which helps with branding. We're impressed by the ease of use and design elements such as the FREE delivery progress meter that incentivize conversion. If your payment information is associated with your Google account, your checkout experience will be fast. This frictionless experience offers a major boost to conversion rates, cart values and repeat purchasing. Google Express is quite different than Google Shopping. While we believe each program is a critical component of your multichannel strategy, it's important to understand the core distinctions. How do I sell on Google Express? To learn more about Shopping Actions, please complete the Shopping Actions interest form. If you are a Zentail seller or interested in using Zentail to manage and grow your multichannel business, please contact us. Zentail is a Google Partner and has a growing number of sellers connected to the Shopping Actions program. If you use Zentail, we can help you integrate with ease. If eligible to participate, you will be able to complete the necessary onboarding stepsand opt-in your products in Merchant Center. Orders are made available via the Google Orders API. You can leverage Zentail’s integration with the Google Orders API and your orders will automatically flow into your Zentail account and be routed to the appropriate fulfillment warehouse or your connected ERP. If you do not use Zentail, you will need to directly connect the Google Orders API to your ERP or order management system. What are the commissions to sell on Google Express? Commissions are comparable to other major marketplaces but this information is not yet publicly available. For a complete overview of Shopping Actions commissions, you will need to be enrolled in Shopping Actions. Shopping Actions and Google Express addresses a major need among online retailers; a unified shopping experience across Google's interfaces including a branded shopping mall that helps to acquire new customers efficiently and diversify your sales channel mix. We believe the retail partners already involved with Google Express validate a win-win ecommerce platform strategy that adds value for retailers by leveraging Google's technology and reach. With a pre-built Shopping Actions integration, Zentail is the easiest way to sell on Google Express. Leading retailers and brands trust Zentail for centralized product information, inventory, order and pricing management for all major online shopping channels. For more information, please schedule a demo.